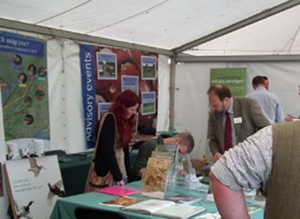 I’ve just returned from two very enjoyable days at the Midland Game Fair in Shropshire. Not as big as the mighty CLA but certainly a great day out with plenty of variety on show and well worth a look if you have the time next year. 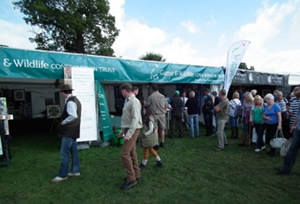 Our membership recruiters, David Thurgood and Steve Richardson booked a bigger stand than usual and we filled it with examples of fox snaring dos and dont's and best practice guidance. We also had the new DOC trap from New Zealand exhibited by Dave Butler from Perdix Wildlife Supplies and Dawn Warr from Dorset, a wonderfully talented artist and taxidermist. We welcomed a number of new members whose support is greatly appreciated and will help to fund future research. It’s great to see that some of these are younger people which is so vital to the future of our countryside. 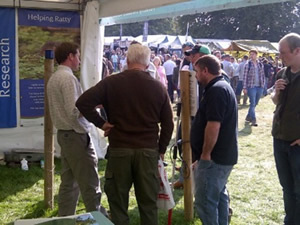 We have had great success with our fox snaring demonstrations this year at both the CLA and midland game fair. It’s apparent that wildlife managers and gamekeepers are keen to ensure they follow best practice and understand the current legislation governing this method of managing foxes. Here is a link to our snaring guidance booklet, it contains important information for snaring practitioners. Our advisory department also offer fox snaring training days which represent superb value and can even be combined with corvid training for those with limited time. If you would like more information please click here.